If you are on a budget, it is difficult to find affordable housing in the United States. Over the last decade, housing prices dropped from their 2007 levels to bottom out in about 2011. Since then, however, the prices have steadily risen to meet their 2007 levels again. The average home price in America is approximately $222,400, as of writing. Housing affordability is not merely a matter of the purchase price of homes in an area. It is also a matter of the income you can earn in the area to afford the home. Knowing the expensive locations to avoid can help with your search, but it is more important to know where the cities with the cheapest homes are. In a U.S. News & World Report survey of over 2,000 residents throughout the U.S., housing affordability was found to be one of the most critical factors in deciding where to live, weighted at 25 percent of all factors. Considered in determining housing affordability were the average cost of renting or owning a home with taxes and utility costs added. Every city listed below as having the cheapest homes was also ranked by U.S. News & World Report for being among the best cities in which to live, based on housing affordability and other economic and social factors. The low cost of housing in Detroit has led to a slow shift in local demographics, with more millennials moving to this city to take advantage of the affordability. New Detroit homeowners are encouraged to spend more for insurance on their home, given the higher crime rate. Still, Detroit comes in well below the housing costs of other similarly sized cities, compared to local household incomes. You can put 5 percent down on a home in Detroit with an annual salary of only $9,000. The median home price in Detroit is about $158,300. This is over $74,000 less than the national median. Other cities in Michigan with cheap homes include Lansing, with home prices around $138,000. Compared with other cities with a high number of government employees, the cost of homes and living are lower than average in Kansas City. The cost of homes on both sides of the state line running through the Kansas City metro area is much lower than in similarly sized cities, such as Chicago. This is slightly offset by the fact the income you can earn in Kansas City is slightly lower than the national average. The Missouri side of the city is much more of a seller’s market, while buyers can find great deals on the Kansas side. With a salary of $31,000, you can put 5 percent down on a Kansas City home. With the median annual salary in Kansas City of $48,900, many residents spend just over a quarter of their income on housing costs. The city of Wichita, Kansas and the cities of Springfield and St. Louis, Missouri offer cheaper homes as well, and with more square footage than other comparably sized homes. Philadelphia is a major metropolitan city on par with a Washington, D.C. or New York. This makes its housing prices, which are just above the national average, relatively cheap by comparison. It only takes a salary of $40,000 per year to put 5 percent down a Philadelphia home. Moreover, housing prices have not fluctuated in Philadelphia as wildly as they have in other areas of the country, including in cities of similar size. The housing prices in Tampa and St. Petersburg, Florida, also known just as the Tampa Bay area, have risen and fallen with the national median. Throughout these price fluctuations, home prices have consistently remained over $20,000 lower, or even as much as around $75,000 less than in other Florida cities. A salary of $53,000 lets you put 5 percent down on a home in Tampa or St. Petersburg. According to U.S. News, an increasing number of professionals are transferring to the Dallas-Fort Worth (DFW) area. This increase has led to Dallas becoming one of the country’s hottest housing markets. Rent and home prices in the suburbs have risen as a consequence, but the area offers more value for your housing dollar than other metropolitan areas of similar sizes. This is based on a comparison of median household income to housing costs. New homes and housing developments are popping up in Tucson all the time. While this leads to a constantly fluctuating housing market, it also means you can find some of the best housing prices around. The median housing price in Tucson is just over $193,392, almost $30,000 less than the national average. Salaries are slightly lower in Tucson, but so are living expenses. The high number of military families living in the Tucson area is factor keeping housing prices relatively low. 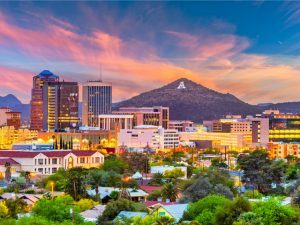 Home prices in Phoenix, Arizona are higher than the national average, yet lower than the prices in similarly sized cities. In addition, the heavy tourist industry in Phoenix helps save homeowners thousands of dollars in taxes each year. Other lower housing costs like services and utilities balance out the slight premium in purchase price as well. You can pay 5 percent down on a Phoenix home with a salary of $57,000.